Healthy agriculture produces healthy beef. At Landtasia Ranch, we raise and care for our livestock naturally as they would have been before the start of industrialised agriculture. Our cattle are raised on beautiful chemical-free grasslands and finished with grass and grain grown on our property. We think it is important for animals to be raised humanely and not forced to eat only grain in crowded factory-style feedlots. Our certified organic beef comes only from livestock born on our farm and not from unknown animals purchased at auctions. Our cattle are not given weight and muscle gaining hormones, toxic drenches, stimulants, antibiotics or genetically modified feed. It costs more to farm sustainably, naturally and organically but our customers believe the end result in taste, nutrition and peace of mind is worth it. Our approach to agriculture reflects our recognition of our customers' desires for natural, healthy, and affordable quality red meat produced from a farm source they can trust. 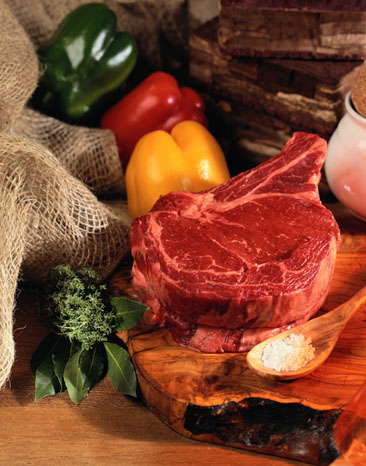 We provide vitamin rich red meat they can confidently serve to family and friends. Our breeds have been chosen based on their nutritional quality and their ability to grow strong and thrive outdoors under changing climatic conditions. We have an Angus hybrid-cross breeding program that produces healthy and vigorous animals and fresh meat of a superior nutrition, taste and texture. We consider grass-fed meat to be nutritionally and ethically superior to intense grain feeding. Our animals grow and build muscle and healthy Omega-3 fats naturally just by eating organically grown grasses. Chemically grown and treated grains are not necessary. Our livestock graze and grow humanely with their herd for about two years. They are allowed to express their full natures which contributes to natural animal health. We believe maintaining a low stress environment for the livestock helps produce more tender and flavourful meat. This has been confirmed to by our good Meat Standards Australia (MSA) beef scores too. These principles are very different than those of the intensive beef industry, which often puts young calves into stressful feedlots. There they are fattened on grain fortify with antibiotics. This is because their digestive systems are not mature enough to handle the a 100% grain diet without becoming ill. This leads to fattier Omega-6 marbling and less vigorous animals. All of which is then passed on to consumers through the normal retail food chain. Aside from the nutritional benefits of our approach, we believe in this age of climate change that 100% grain feeding doesn’t stack up environmentally either. It takes a lot of fossil fuel and releases a lot of greenhouse gases to fertilise and transport grains to crowded and polluting feedlots. Livestock are far healthier and content roaming in the sunshine, munching and resting on natural pasture grasses. And those grasses also perform the invaluable role of sequestering atmospheric carbon and moisture in the soil naturally.